I always say the strawberry is my favorite berry, BUT it’s not actually a berry! It’s an accessory fruit, whatever that is. I love that little luscious juicy red fruit, berry or not. It’s so yummy it needs no friends to make it better at all! But oh how much yummier desserts are when the strawberry makes an appearance! 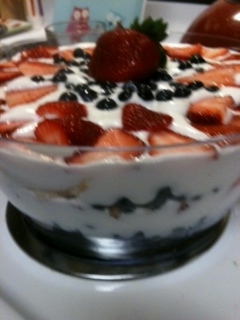 I find myself unable to make a summer dessert without the use of strawberries! And so… I must share these desserts with you. I used skinnytaste.com’s exact recipe. Only hers was a lot prettier than mine. This is sooo good and EASY! I sliced my strawberries on my mandolin for even easier preparation. You should definitely make this for your 4th of July celebration! It’s only 4 points for an entire cup! I promise no one will be able to tell it’s low fat and Weight Watcher friendly! I made this one for my RAs last semester. It was their favorite dessert and they attest that it does not taste figure friendly at all! I used this skinnytaste.com recipe with a few modifications. I used a premade reduced fat graham cracker crust. I made the filling exactly the same. I used Kroger brand honey flavored greek yogurt instead of vanilla. It was so yummy! 5 points a slice. A “normal” slice of cheesecake can rank up to 12 or more points a slice! This recipe is all me. I had the vision for it and thought it would be called a trifle, but did some research to be sure. The cake part of traditional English trifles are soaked in some sort of liquid, normally an alcohol. This (the soaking not the alcohol) inspired my recipe to perfection! I baked a box cake mix angel food cake and let it cool. FYI, I tried making a completely homemade angel food cake and it’s not worth it! I always like to try to do everything from scratch at least once to see if it actually is better. OFTEN it is better homemade, like in the case of pound cake or spice cake etc. But I am not afraid to use a box ever, particularly if it’s equal in taste and costs less. In the case of angelfood, it does! To do homemade angelfood you have to use 12 whole egg whites. A. That’s a lot of eggs! B. That’s a lot of egg yolks to do what with? So I say, go for the box or a premade one, I prefer making the box one to a premade one. While it’s baking and cooling slice strawberries (I of course use the mandolin). I let their juices form a little in just a little splenda, you don’t need much. It doesn’t need to produce as much juice as you’d need for strawberry shortcake. Prepare the pudding with 1 1/2 cups of fat free milk. Fold in one container of cool whip and let it soft set. I use my Kitchenaid mixer to do all of that! Just easier AND I love using it. Use the wisk for mixing in the milk and the flat beater attachment on low to fold in the cool whip. Once cake is cool, break it into bite sized pieces. Pour the juice from the oranges evenly over the cake, tossing to make sure all the cake gets saturated in some juice. Layer half of the cake, half of the strawberries, all of the pudding, rest of the cake, rest strawberries and top with the other container of cool whip. Sprinkle orange zest evenly on top. I’ve made this twice and everyone loves it! It’s so light and fluffy and the orange is a perfect compliment. It’s about 5 points per cup.